We take care of each other to reach the goals we are striving for--to get there in one piece, together. Balancing a focus on task and product with nurturing relations between people sustains organizations and movements for the long haul. If the focus feels dominated by intended goal or product then take some time to tend to the relationships of the group. Some possible indicators that attention of this nature is needed are if some people are falling silent or if there is not enough group cohesion. More generally, tending to relationships can be a foundation of group work at all points of the life cyle. 1. Check-ins: Everyone checks-in and is able to name where they are at emotionally and energetically. This prevents assumptions, misunderstandings and allows people to become present. Builds group cohesion. 2. Appreciation: Express appreciation to each other at the end of meetings during check outs/go arounds or if people are feeling blocked. "When Sarah shared her insights about the project, I felt like I wasn't alone in what I was feeling." 3. Acknowledging vibe changes, discomforts, silences and group dynamic shifts that may be unvoiced. "When we worked on that project today, I noticed that things felt very different between us. Did anyone else feel. . . ." "When we started this project, there was tons of energy and excitement and now that time is running out, we seem to be getting rigid." 4. Allow disparate voices to be heard without fear. 5. Validate each other--validation doesn't equal or require agreeement; rather, it is simply acknowledging the other person's perspective or at a minimum their good intention. Remember that in most cases there aren't perfect answers, and that intelligent people of goodwill can have legitimate differences of opinion. 6. Follow-up with each other about important stuff outside the formal meetings. 7. Remind people that what we are trying to do is hard work! So be compassionate and supportive toward each other. 8. 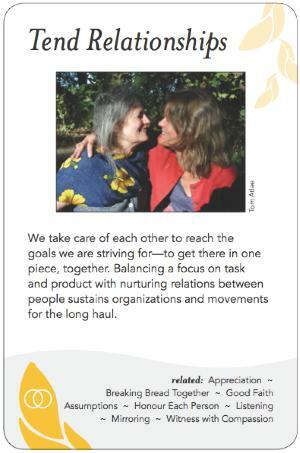 Build time to just connect (potlucks, gatherings, celebrations, rituals, songs, dancing, extracurricular social gatherings, invitations, etc.). It appears to slow things down and value idiosyncratic disagreement over majority agreeement. Tending relationships can be frustrated by or overriden by individuals who believe that those with less experience in the content area or focus of the organization are "derailing" a potential outcome. In constrast, allow for recognition that sometimes one person's needs are greater than the capacity of the group. (connects to other patterns). Don't go overboard! There is work to be done, too! In cases where those directly involved have an expectation or desire for privacy, it's important to handle decisions around "outing" the issue with care. It's best to try to design a process of invitation, discussion and discernment around whether to bring an issue into the group as a whole that is both respectful of the individuals, and of the group's need. Example: A disrespectful or abusive interaction between two organization members may be isolated, or may be an indication of an underlying issue in the culture of the organization.